Just like he did many times during the 2018 racing season, Philip Morris outlasted the competition and pulled away at the end to win South Boston Speedway’s Overall Most Popular Driver contest. 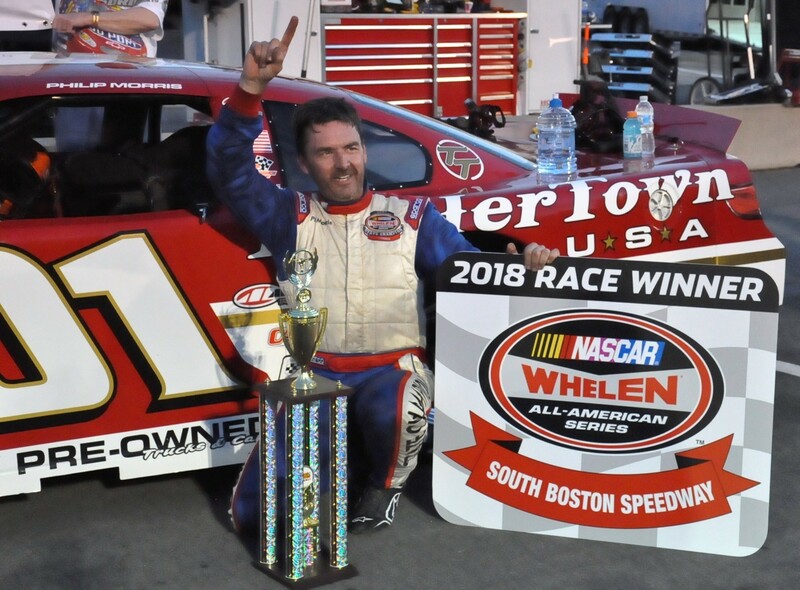 In an online vote of fans to determine the track’s overall most popular driver, Morris, who had 10 Late Model Stock wins at South Boston in 2018, and Kenny Daniel, a Hornet Division driver, were in a heated battle for most of the two-week voting period. Daniel led much of the contest, but Morris overtook him down the stretch. Morris tallied 8,003 votes in balloting while Daniel finished with 7,598, a difference of 405. This was the second year the track has conducted the online contest and it is obviously popular with fans. In 2017, 11,215 votes were cast. This year’s total was 21,153. It was another storybook season for the 53-year-old Morris, who captured his fifth NASCAR Whelen All-American Series national championship. In addition to the 10 South Boston wins, he won 13 more times at tracks throughout the region for 23 wins in 35 starts. Daniel, a South Boston rookie, didn’t have a win in 2018, but finished in the top five in most races and was fifth in the season-ending points standings. And while he didn’t win a race, he won the hearts of fans with his efforts to raise awareness for Angelman syndrome, a rare neuro-genetic disorder his daughter Kendal was diagnosed with when she was two. The hood of his race car is adorned with blue angel wings to bring attention to the disorder. Gift certificates for the 2019 South Boston Speedway season are on sale in time to make a great Christmas gift. They may be purchased by calling 877.440.1540 or stopping by the office Monday through Thursday from 9 a.m. to 5 p.m. PREVIOUS POST Previous post: Northeast Race Cars & Parts Named as New Authorized FURY Dealer in Northeastern U.S.